JIGGING - Having joined the twin jacks with a good series of welds, then each unit was aligned with the carriage main frame and also welded in position. 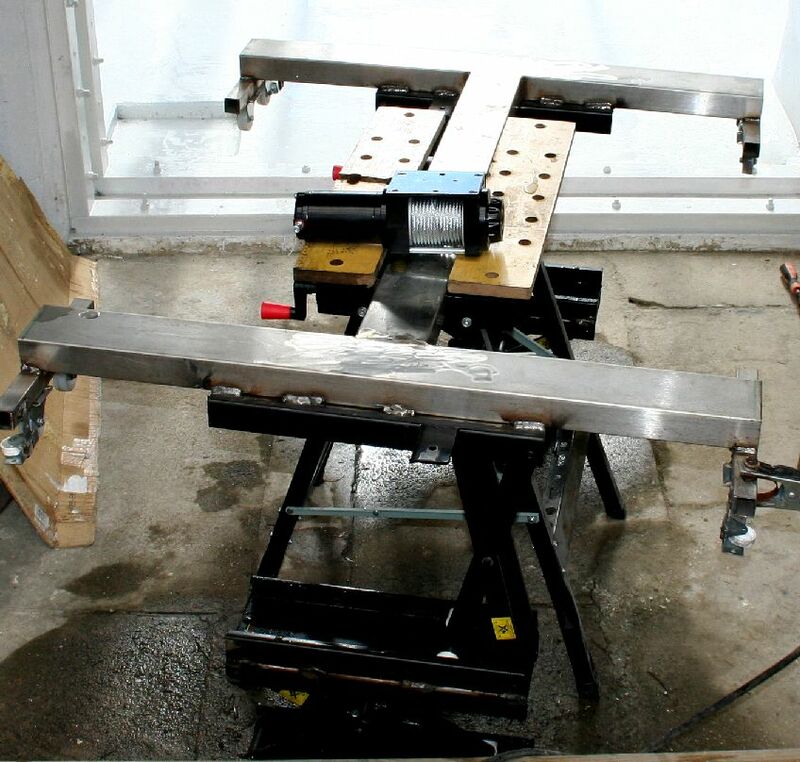 We used a series of clamps to micro adjust the lifting and lowering mechanism to the carriage. Copyright © photograph July 15 2018. All rights reserved. You will need the permission of the Cleaner Ocean Foundation to reproduce these diagrams except for educational use or private research. All the parts to make the carriage lifting and lowering mechanism had been collecting in and around the test tank area. The main obstacle to progress was the sealing of the floor and repair to the sluice gate, where a small 'V' in once corner was allowing water to weep rather annoyingly. As each snag in overcome, the team move forward to the next challenge, in this case welding the component parts together and fitting a 12v winch motor to the carriage frame to connect with the lower frame by cable that is strong enough to lift the model and gimbal heads and handle dynamic loads when the SeaVax is undergoing tests in rough wave and wind simulations. LOADING - The mast can be raised to clear the sluice gate for loading, then carried out into the water tank and lowered into the water. This was the theoretical drawing that led to the fabrication of the real thing. Copyright © drawing February 17 2018. All rights reserved. You will need the permission of the Cleaner Ocean Foundation to reproduce these diagrams except for educational use or private research. HEAVY DUTY JACKS RAISED - The difficulty we had was sourcing a lifting and lowering mechanism that came within our budget. 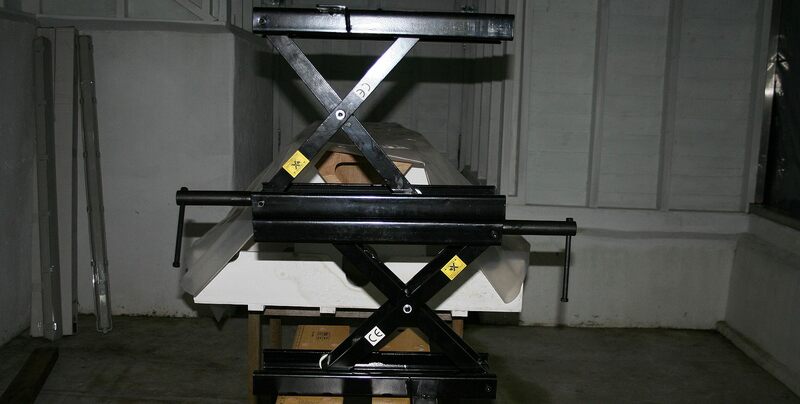 We decided on using a scissor jack system with a 500kg load carrying capacity as a static measurement, but halved to 250kg for our dynamic tests + a hefty safety margin. We had to use two jacks in series to achieve around 600mm of lift. Here you can see the jacks compressed up, or in the raised position. We have to modify these units by welding them together and replacing the scissor-screw mechanism with a heavier electric duty winch system. Copyright © photographs January 23 2018. All rights reserved. You will need the permission of the Cleaner Ocean Foundation to reproduce these diagrams except for educational use or private research. LOWERED - In this picture you can see the jacks in the lowered position - when used as jacks that are of course in the raised position. It's role reversal in our application. We are using a 4,000lb electric winch with remote control. All of the machinery in this test tank will be 12 volts, except for the wind generating fans and LED lighting. Copyright © photographs January 23 2018. All rights reserved. You will need the permission of the Cleaner Ocean Foundation to reproduce these diagrams except for educational use or private research. AWKWARD - Having removed the screw threads from the original jack setup, the scissor mechanism touched the floor. We had to use clamps to hold the jacks closed while completing welding operations that involved turning the carriage to get a good weld position. Copyright © photographs July 15 2018. All rights reserved. You will need the permission of the Cleaner Ocean Foundation to reproduce these diagrams except for educational use or private research. 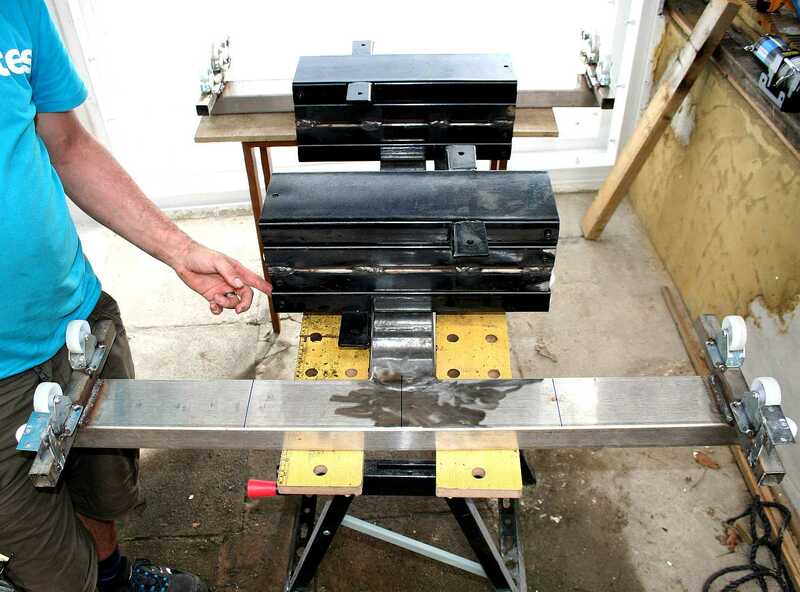 MARKING OUT - When fabricating any framework in steel, It is very important to mark out accurately with centre lines for reference. Copyright © photograph July 15 2018. All rights reserved. You will need the permission of the Cleaner Ocean Foundation to reproduce these diagrams except for educational use or private research. HEAVY STUFF - It takes quite a lot of metal to complete a heavy-duty lifting and lowering mechanism like this. Once the welding was completed for this stage, we simply had to lift it into position. Two men just about coped with a lot of grunting. Copyright © photograph July 15 2018. All rights reserved. You will need the permission of the Cleaner Ocean Foundation to reproduce these diagrams except for educational use or private research. LOWERED - The carriage is seen here in the lowered position. Copyright © photograph July 19 2018. All rights reserved. You will need the permission of the Cleaner Ocean Foundation to reproduce these pictures except for educational use or private research. ATV WINCH - These 12 volt units are great value and have a lot of grunt but needed customizing for our purposes. These units come with one 6mm steel bowden cable and one hook eye. Copyright © photographs July 15 2018. All rights reserved. You will need the permission of the Cleaner Ocean Foundation to reproduce these pictures except for educational use or private research. DUAL CABLES - We needed to modify the single cable spool to accept two cables, also inserting steel rollers over the lower bolts. The twin cables attach to two lifting hooks on the lower frame of the carriage to lift the unit and keep it horizontal. Copyright © photograph July 19 2018. All rights reserved. You will need the permission of the Cleaner Ocean Foundation to reproduce these pictures except for educational use or private research. This website is provided on a free basis as a public information service. Copyright © Cleaner Oceans Foundation Ltd (COFL) (Company No: 4674774) 2018. Solar Studios, BN271RF, United Kingdom. COFL is a charity without share capital. The names Amphimax™ RiverVax™ and SeaVax™ are trademarks.